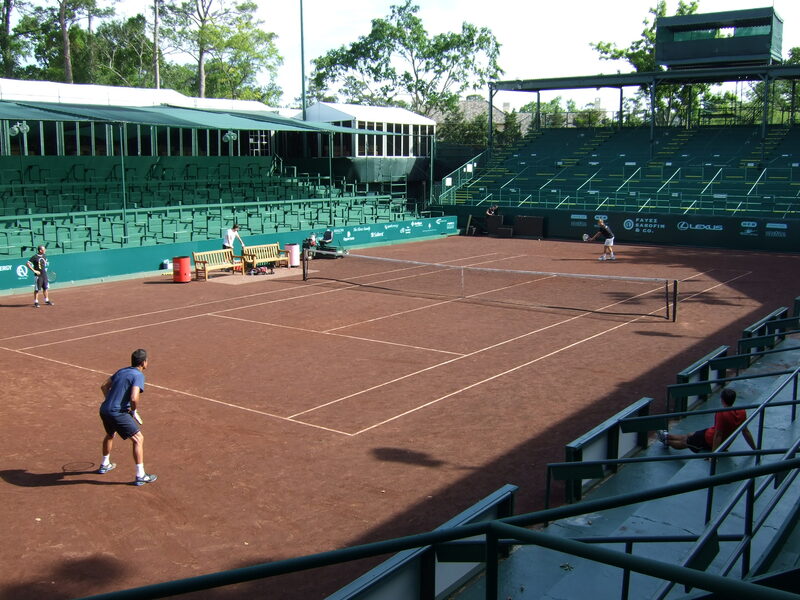 When I got the official letter granting me a media credential for the US Men’s Clay Court Championship, the ATP 250 played in Houston, it said that the media room would open at 3 p.m. on Friday, April 5. Hence, I wanted to be on site at 3 p.m.
At 2:50, I was in my car, not even on I-45, the interstate that I needed to take to get from one end of Houston to the other. At 3:10, I finally made it to the interstate after trying a “shortcut” that I’m pretty sure added about five minutes to my drive. At 3:20, there was an accident on I-45. Fender-bender, nothing major. At 3:25, I was driving around the Allen Parkway, and marveling at how nice the scenery is there (as you’ve probably heard, Houston is not known for its beauty. More on this at a later date). Minutes later I was on Kirby Drive, driving past mansion after mansion. At around 3:30, I was let into the River Oaks Country Club. The guard at the gate gave me directions to the media office, and once I came out of a small parking deck, I thought I found the building the guard told me to find, but it had a sign that said that only country club members were allowed inside. 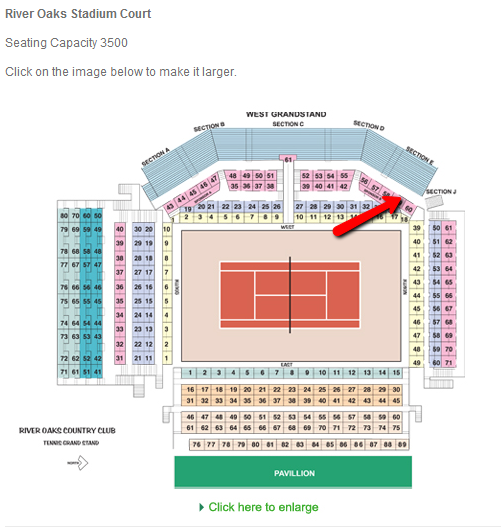 So I went to the building next door, and saw the first glimpses of the oncoming event: the main stadium was to my left, and its outer walls were covered with posters of the featured players of this year’s edition: John Isner, Nicolás Almagro, Sam Querrey, and James Blake. Anyhow, I walked into the non-country-club-members-only building, and found myself in a large room filled with round tables. At the end of the room, behind a rectangular table, sat a lady who was talking to someone on an iPhone. I thought I had found the media office, since I saw some credentials on a small table nearby. The lady finished her call, asked what she could help me with, and I said I was there to pick up my media credential. Turns out, I was at the wrong place. The lady in question was Woodie Walker, who works for the USTA and is in charge of the match officials for the tournament (after some Googling, I found that in 2003 Woodie won the President’s Award from the USTA – no small feat). We immediately started talking about many things: she told me Ali Nili was going to be the main chair umpire (he’s got a gold badge), and that Damián Steiner would be coming. She also told me about how she met Steve Ulrich (who recently retired at Indian Wells) when he was 16 years old. Which I found amazing. Then again, Woodie is just fantastic. Davis Cup came up, since she said some of her officials were coming directly from Boise. She couldn’t pull up the scores on her iPhone, so I gave her the match updates from my Nexus 7. Woodie said that she would like to have the Davis Cup app on her iPhone, but she just got the gadget and wasn’t sure how to add it. I’m not great with iPhones myself, me being a dumb-phone user (and a proud one at that). I still gave it a try. A few minutes later, the Davis Cup app was on her phone, and she was happy – until she remembered that she was trying to order food from a deli and couldn’t find a catering menu anywhere. I left the officials’ room at around 4:30, I think. I was no longer worried I was late, because Woodie had told me that the draw was going to be made at six. Woodie had also given me directions to go get my credential: I had to go into the building that was marked as being only for country club members. The building in question holds a pretty spectacular gym on the second floor, but has some offices in the lower level. I made my way to the last office at the end of the hall, and found a few young people walking around carrying all sorts of things. One of them made me my credential. My first ever credential to a tennis event. I put it on, and walked out of the building, hoping to find the office where the draw would be made, which was at the other end of the stadium. As I walked around, I noticed the unmistakable loud “THWACK” of a tennis ball being crushed. The sound came from inside the main stadium. As you can see, the Stadium Court is a nice little place to watch tennis. – Almagro’s coach, Samuel López, who was wearing a Juan Carlos Ferrero Equelite Academy t-shirt. – A young man wearing a Lotto shirt – I assume he’s with Almagro in some capacity. – Middle-aged woman taking pictures. I was immediately surprised by the lack of verbal communication between everybody actually involved in the practice set. What struck me as odd is that nobody was calling out the score (my bewilderment at this detail outed me as a practice-set rookie – apparently nobody calls the score during practice sets). Regardless, Almagro and Harrison were absolutely crushing the ball. Both men were moving well, but every once in a while, Almagro would miss a shot and let out a short, frustrated groan. First he was having issues with his backhand, and then he started to lose patience with his forehand. The latter stroke let him down a couple of times, and in pretty much the same way: the ball was ending up in the net. After yet another forehand was dumped there, Almagro let out one of his classic frustrated screams. He was not happy. What I found fascinating is that Almagro was hitting the ball quite well most of the time. The man from Murcia hit his fair share of winners after long rallies that Harrison could only acknowledge with a “great shot” or a thumbs up (the best point of the “set,” as far as I saw, ended with a terrific Harrison volley). Almagro, a most talented player, is most likely a thorough perfectionist. 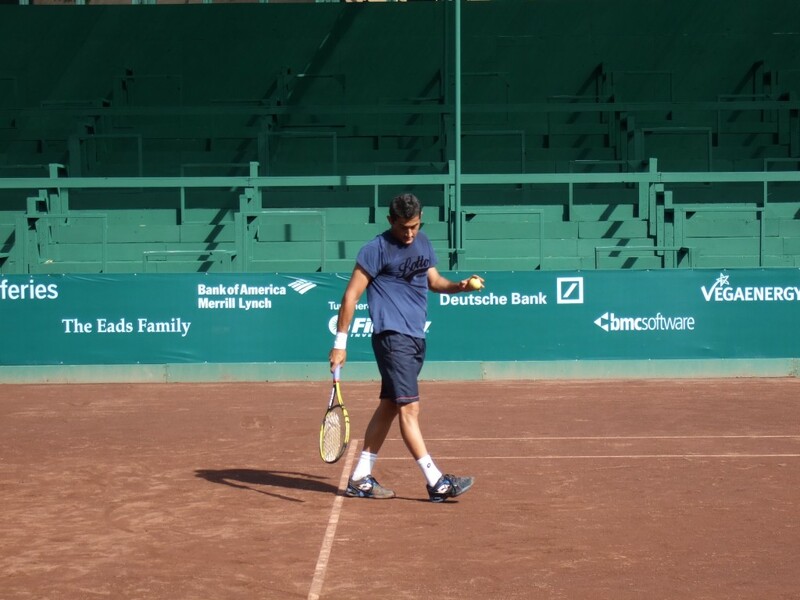 Everything needed to work perfectly, including those short forehands. During the rallies between the two men, you could see the difference in pace and weight on their shots. Most of what came out of Almagro’s racquet was a heavy missile. That same quality was achieved sporadically by Harrison, who was also having issues finding ways to return Almagro’s second serve. The Spaniard hits a nice kicker, and Harrison wasn’t timing the returns well enough to take them on the rise. After the practice set was over (won by Almagro), Ryan Harrison was getting ready to leave. I saw then that maybe he had been the most frustrated player of the two early on: one of the racquets he was putting in his bag was completely smashed. At that point, the lady who was taking photographs asked from the stands if she could have the smashed racquet. “No, ma’am,” responded Ryan, as he and his dad were leaving the court. López then got a basket full of balls, and planted himself between the two groups of empty cans. He first fed Almagro some deep balls, and later some shorter balls. 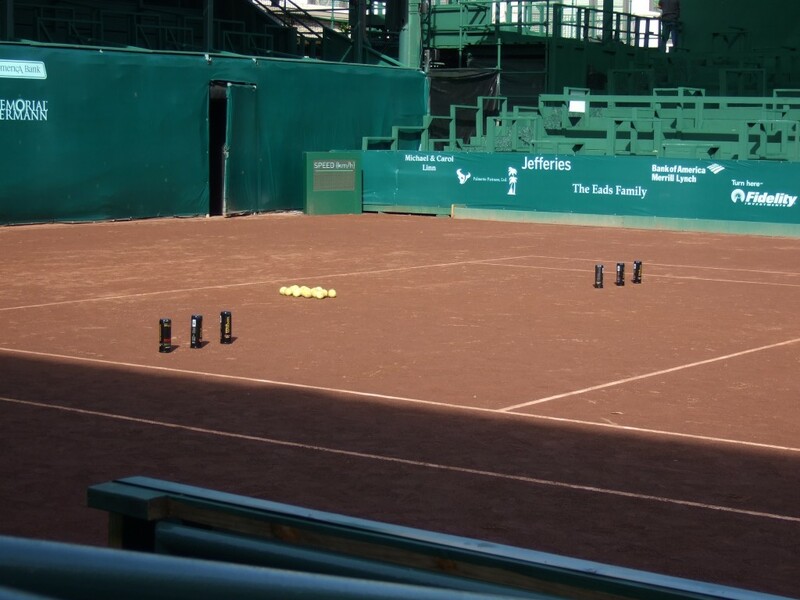 Almagro was supposed to hit as many forehands as he could, and of course, he had to try and hit those ball cans. 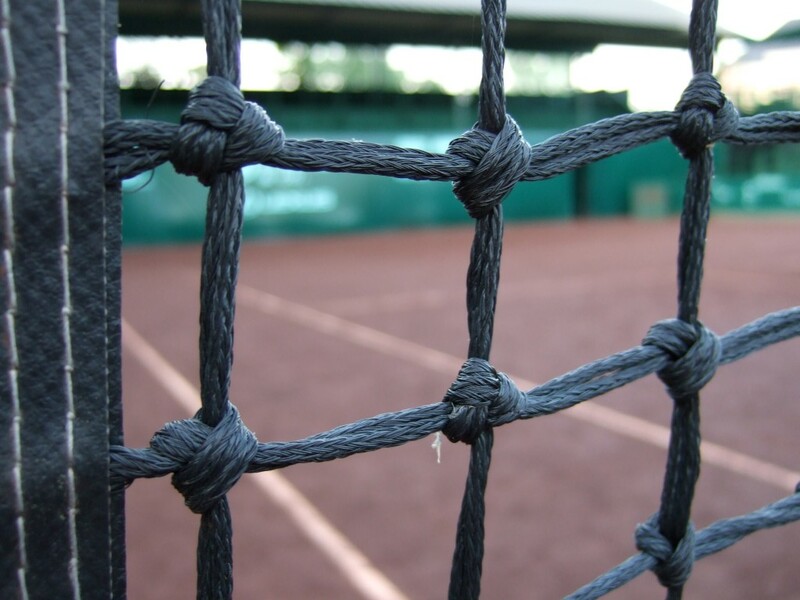 I saw him hit four (three forehands and one backhand), and each time it was breathtaking. Naturally, during the short ball drill, Almagro dumped a forehand into the net. He screamed again, but this time some expletives were mixed in, and after he grabbed the ball in question, he smashed it into the back fence. Almagro does not like missing those short balls, and I fully sympathize: the elite in tennis rarely misses them. Moments later, Almagro looked in my general direction with a mixture of sheepishness and annoyance. At that point, I was the only other person on the stadium besides his team. I’m guessing he wondered if I understood any part of his tirade. Sorry, compadre, but yes, I did. My conclusion: if you’re ever at a tournament, go watch Nicolás Almagro play or practice. Watching him hit the ball is a unique experience. And you have to watch him serve. Let me repeat that: you really do have to watch Almagro serve. Anyway, I walked away to check out the little office where the draw was going to be made. There I saw two people that I knew (one from real life, and one from TV): Woodie was there, and the tall man next to her was Ali Nili. Woodie saw me, and introduced me to Nili, who seemed pretty nice. In a moment of unexpected nerves, I asked Nili if he had been in Miami. As soon as I said that, I felt stupid, because just half an hour before I had showed Woodie the video Amy posted of Gasquet telling Nili in Miami that he was not his father. Woodie and I laughed at that. (as an aside, I showed Woodie our site, and she laughed at some of the Search Terms. That was a highlight of my day). Anyway, I went back to the court and watched Almagro try and hit more empty cans. Moments later, I went back to that little office underneath one of the stands, and I realized that the draw was happening, right there and then. Which is a brutal and unlucky first round. Neither guy is seeded, and it’s truly unfortunate to have two big names face off against each other so early in the event. Fascinated, I stayed on, watching how the draw for the 2013 US Men’s Clay Court Championship was made. The room, as I said, was small: probably the size of a large guest bedroom. It had a desk and some chairs. After the draw was over, I asked if I had heard correctly that Blake and Monfils were going to play each other. As I walked in, the man who wasn’t facing me before turned around and introduced himself to me: it was Pete Holtermann, who is the Media Director for the event. He knew who I was, and immediately said that not only Blake and Monfils play each other: the winner plays Almagro, who has a first round bye. I then headed over to the media center, which was also located under one of the main stadium stands. It’s a long, somewhat narrow room full of rectangular tables. At the far end, there’s a backdrop with sponsor logos: that’s where the pressers will take place. As soon as I entered the room, I saw that there was a single female there. I introduced myself in English, and when I said my name, she started to speak to me in Spanish. Turns out, this was María García-Planas, a Catalan who does PR for the ATP. Like Pete and Woodie before her, María was super nice, and we chatted for a while. Soon after, Marcelino (I forget his last name) came in, a veteran Spanish reporter who works for one of the major news agencies (AP or AFP, I forget which one). Pete came into the room, and handed us copies of the draw, which you can find here. There I saw another first round popcorn match: John Isner, who most likely will be coming off a fifth rubber performance against Serbia in Davis Cup on Sunday, will face off against the young American who I had just seen practice moments earlier: Ryan Harrison. During this time in the media room, Michael Russell came in. He was super friendly, and I gave him my copy of the draw for him to see. He looked pleased: Russell starts against a qualifier and then meets either Martín Alund (who took a set off Nadal in Sao Paulo) or Lleyton Hewitt, who will be travelling back from Uzbekistan, where the Aussies are playing a Davis Cup tie. Later, I heard some music coming from behind me, and I heard someone speak English with a French accent. I turned around knowing full well who it was: Gael Monfils. LaMonf was in good spirits, and as he saw his tough draw (Blake first, and if he wins, Almagro), he smiled and laughed. That’s the best attitude one can have at such a challenge, I think. After all, Monfils hasn’t played a competitive match since Marseille, and he’s on a two-match losing streak at the moment. His ranking of 104 says it all. Anyway, I hung out in the near empty media room, where at some point Pete played some tunes. As I was tweeting about the draw, Bon Iver’s “Skinny Love” came on. I remembered what a gorgeous song that is. At around 7 p.m., I checked traffic. I will write later about Houston as a whole, but one of the things I’ve learned in my first few months here is that you always want to be aware of what traffic looks like. I-45 seemed to be in decent condition, so I packed up my few belongings (the Nexus 7, the draw, the ATP media guide and other assorted papers) and headed out. I went back to the main stadium, which was empty. I took my chance and walked a few feet inside the court. 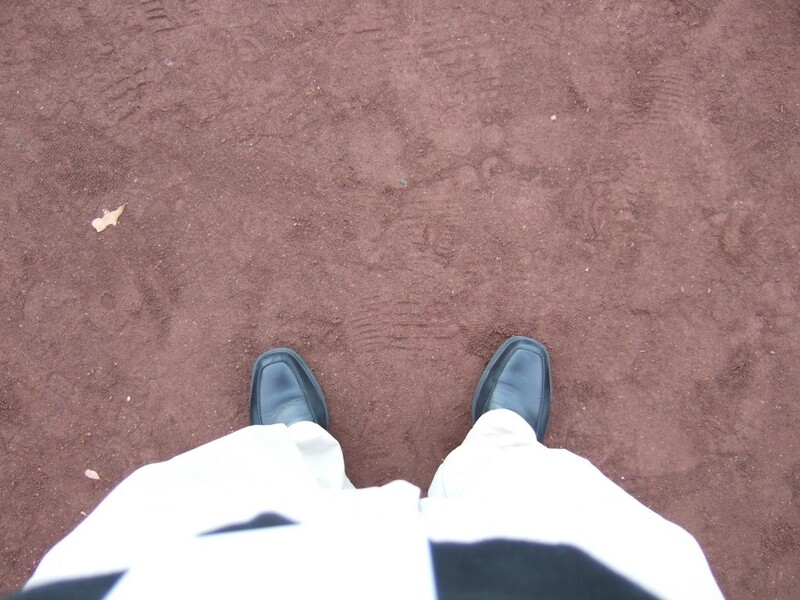 I wanted to feel what the dark red clay of Houston is like. And since I was wearing dress shoes, all I could tell is that it felt weird. 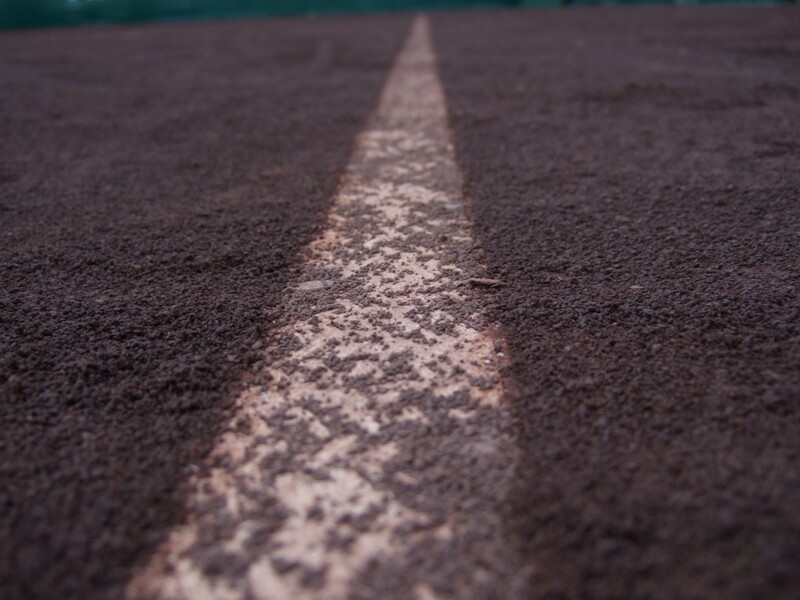 It was a soft surface, but not nearly as soft as I remember the Ecuadorian red clay to be. It’s difficult to describe. Hopefully I can ask some of the Spaniards and Latin Americans about the differences of this specific surface and the stuff with which we are most familiar. I took some pictures, and walked out. The sun was setting, and while the scenery was still beautiful enough to sit down somewhere and contemplate the sights, I had to drive home. After all, I was working off a granola bar and a bowl of cereal. The adrenaline and excitement of being at a tournament site and being allowed to walk around, look and ask questions had been enough fuel for me, but my body was reminding me that it was getting hungry. And I was a 45 minute drive, if traffic cooperated, away from home (and dinner). I LOVED this, JJ. I’m so excited for your coverage this week. Sounds great, Greg! I’ll be wandering around the grounds, but I do like to pop in and out of the media center from time to time. See you there on Monday!